By donating your hair, you give strength to women who need it the most. Hellenic Association of Women with Breast Cancer “Alma Zois”, in collaboration with PANTENE and AB Vassilopoulos, carry out for the fourth year “Donate Strength” hair donation program in order to provide wigs to women undergoing chemotherapy. Your support is valuable and has given us strength to carry on for the 4th year! Together we have managed to collect more than 30,000 braids and 300 women have already taken their own wig through the program. How can I donate strength? You can cut your hair in the hair salon of your choice! For your convenience, “Donate Strength” program provides the possibility of free prepaid shipping for your donation. Once you have cut and packed your hair, you can fill the online form. Prepaid carrier will pick up your hair from the address you have stated on the form within 15 working days. The carrier will visit the pickup address without prior notice. By submitting the form, you will receive a thank you letter in your email. Do you want to send your hair with prepaid shipping? Press here! Note: The free shipping procedure has changed since June 2018 due to the European Privacy Act (GDPR), which requires written consent for the use / management of personal data. In case of sending your hair by post mail, registered mail is not required. In case of sending your hair by courier, our Secretariat’s operation hours are Monday to Friday 9am – 5pm. Your email address and the phrase “I would like to receive a thank you letter from Hellenic Association of Women with Breast Cancer”. You should receive a thank you letter by email within 45 days. If you wish to deliver your hair to our offices, you can visit us from Monday to Friday from 9am to 5pm. 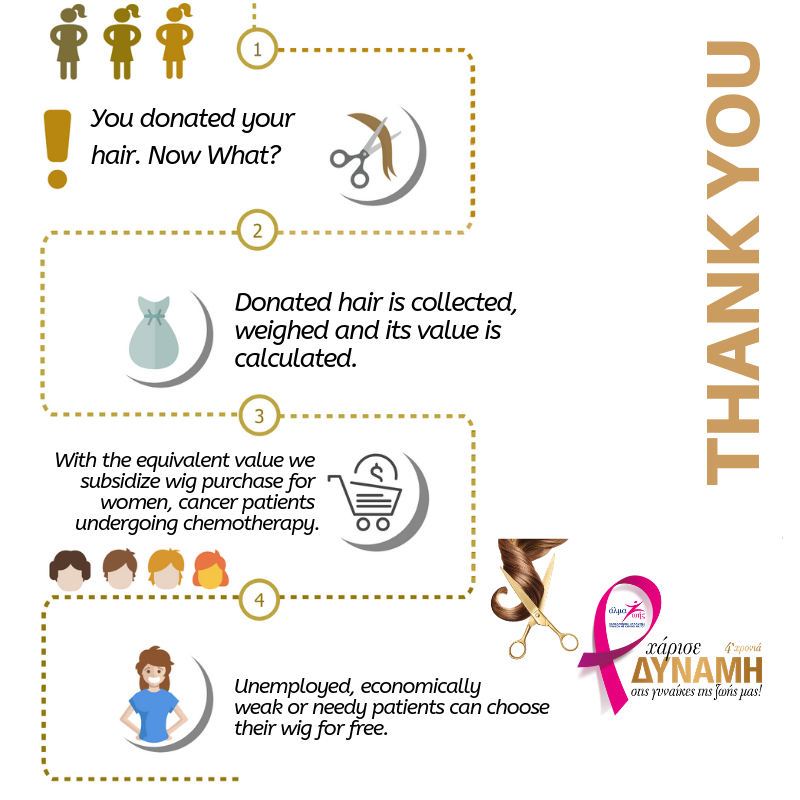 Since November 12th 2015, with every purchase of PANTENE product that you make exclusively from AB Vasilopoulos, 0.02€ are donated to Alma Zois in order to help women that face cancer get their wig. It is important for us that you know how your donations are used! The hair collected is promoted to a wig manufacturer, weighed and their value is calculated. With the equivalent value of the send hair, “Alma Zois” subsidizes wig purchase with socio-economics criteria, for women suffering from cancer and undergoing chemotherapy. The more braids gathered, the more women will be able to get their wig free. That’s why your participation is so important! Would you like to get your wig through “Donate Strength” Program? “Donate Strength” Program’s goal is to provide wig to women undergoing chemotherapy. Wig provision is based on assessment of the request, based on socio-economic criteria. Since you meet the above, you will get the wig you need for free!